Meghan Chase is a somewhat human girl who once lived a somewhat normal life. That is until the day came when she learned that there was another realm beyond her imagination to which she also belonged. The infamously mischievous Robin “Puck” Goodfellow turned out to be her oldest childhood friend, and King Oberon of the Summer Court was revealed to be her birth father. But certain events have progressed matters in the Faery world to a degree that has made Meghan’s role in this magical place not only pivotal but also critical to its survival and to that of all who inhabit it. By defeating the Iron King, Machina, Meghan earned some recognition from the Fey, but she still is considered a half-breed and feels as though she doesn’t truly belong in either realm. Exiled from the Nevernever, with her lover Prince Ash of the Winter Court, the two are forced to roam the mortal world until the promise of another war calls them back into service. Then a false Iron King emerges and threatens all of the Fey. Meghan, as the only one of her kind, holds the key to saving the Fey and their lands from the looming Iron threat and what could be certain annihilation. But every battle thus far has come with a price. What will Meghan have to sacrifice this time to save those that she loves and the fickle land that she now considers her home? The Iron Queen is the third installment in the highly popular Iron Fey series, and the characters of the series are really what have driven this book from fantasy to fantastical. The individual characters have begun to deepen as the story has progressed. In this book, readers begin to know Meghan, Ash, and Puck on another level, one that makes them real and relatable. We begin to see below the surface of each character to the well-constructed personalities and beings that can hold their own—and will surely gain the following of loyal fans. Kagawa’s ability to create a fantastical world is quite unique. Her attention to detail, plot formation, and gentle whimsy make the novel sparkle with originality. Readers don’t just read about the realms she has created, they visually create them in their mind through her excellently detailed and thorough depictions. From a seemingly neverending love triangle to exhilarating battle scenes, readers are taken again on a bewitching journey. 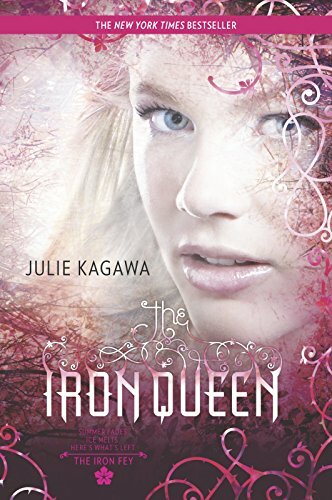 At times as a series progresses often the quality of the writing and plot can suffer, not so with Julie Kagawa’s Iron Fey series in which the third volume shines as the best yet. Courtney Webb is a former librarian and reviewer for Charlotte Mecklenburg County Public Library Reader’s Club and Book Hive: A Guide to Children’s Literature and Books.